This clutch is genuine leather embroidered in black. The lining is black with a chunky brass zipper. 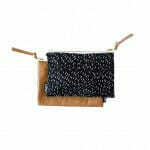 The leather clutch comes with a removable snap hook wrist strap. Great for events as an occasion bag. NOTE: Embroidery is only on 1 side of the clutch. Reverse is plain leather. CARE: Polish leather when necessary. Made in Cape Town from start to finish. INNER MATERIAL: Lining is 100 % cotton which is screen printed using eco-friendly inks. FINISHES: Brass Zip. Brass snap hook with a leather wrist strap. REVERSE SIDE: Genuine Leather on both sides.